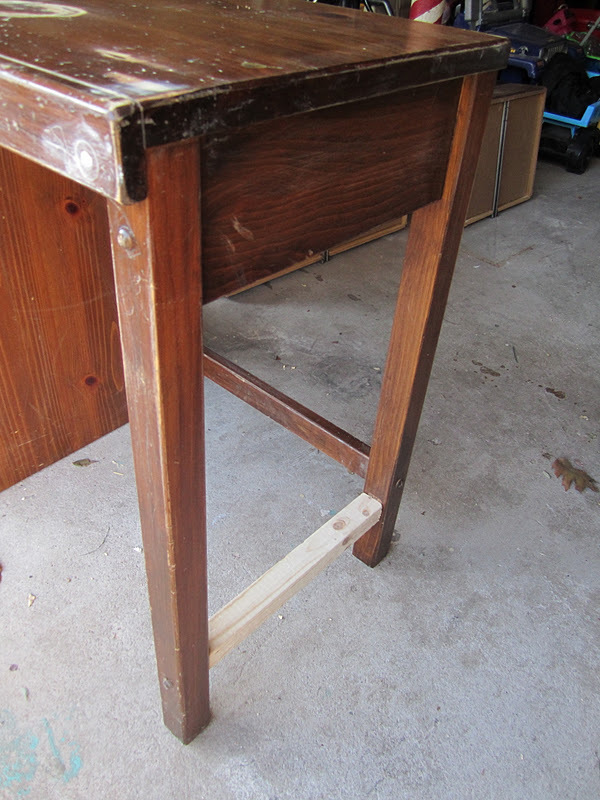 First, I took out the drawers and took off all of the hardware. Here is a close up of the dresser's hardware. Kind of odd, no? I noticed the desk had little panels on the fronts of the dressers, which screamed 1970s to me. I took my crowbar and gently pried them off so the drawers would be nice and flat. Next, I sanded the pieces. 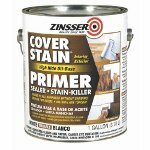 I cleaned them up and used a coat of oil based primer - my favorite brand: Zinsser Cover Stain Primer (it's the best. Really). Next up: paint! 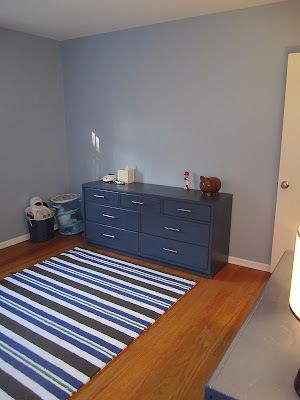 I chose Naval by Sherwin Williams matched to Valspar's paint. I love Sherwin Williams. I do. But we live less than 5 minutes from Lowe's and I've had great luck with Valspar paints. Three coats later and the pieces were looking good! I will warn you: if you ever have a paint color matched be sure to hand over the paint number too. I told the guy at Lowe's "Naval" and he typed in "Navel" - like the orange. He handed me a gallon of neon orange paint. Thank goodness for the Oops shelf. Hopefully someone will need a gallon of bright orange paint in semi-gloss. [note: I'm not sure what possessed me to get a full gallon of paint. I barely put a dent in it ... double oops]. Here are the pieces before I put them back together. Finally, hardware. I needed a lot of it, with 7 drawers on the dresser and 4 drawers on the desk. I found some great satin nickel pulls at Lowe's. I found 10 for $20 (in a contractor pack - 3-inch pulls). I went with a simple satin nickel oblong knob from Lowe's on the small desk drawer to break things up (at $3). Unfortunately, the old hardware holes on the large drawers did not work with the 3-inch pulls - so rather than drive myself crazy, I went back to Lowe's and picked up four 4-inch pulls for an additional $12. Ta da! 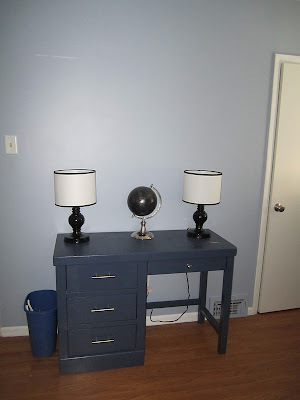 They totally transform the dresser, don't you think? And finally, here is the furniture in place in Big's room! So nice right? I still have a lot to do in here, like add artwork and a mirror, but that will happen soon! Do you love to paint furniture like I do? Isn't it so gratifying to take something sad and shabby and breathe new life into it? Let's swap stories! Wow!! Both pieces look awesome! Well done, my friend! These look amazing! The color is perfect and I love the new handles. What a steal! Wow Shanna, they both look awesome!! You are a painting goddess :) Love how they tie together with O's room! Wow that is looking great. What a change you must be so happy. Thanks for all the props, guys! I am so happy with the end result. 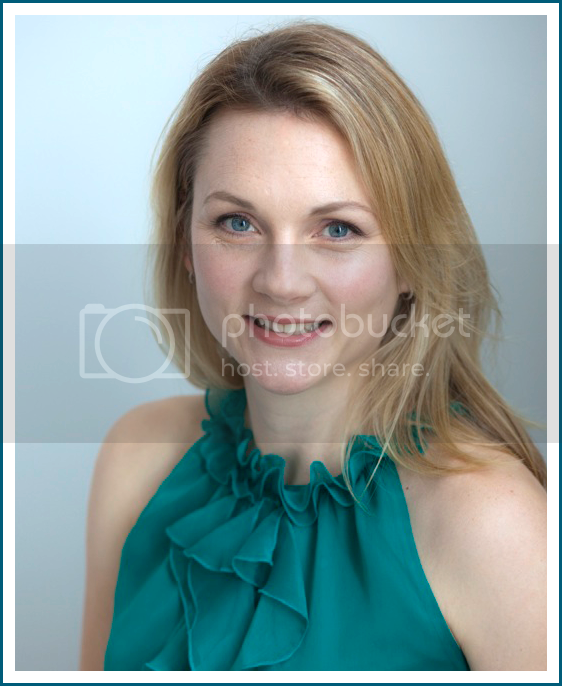 I love that--the color is stunning!